Understanding the important aspects of a mine plan and its value. The mining industry reports hundreds of billions of dollars in revenue every year. 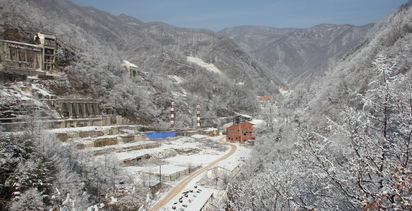 Mine planners possess the mandate to evaluate and update several mine plans on a regular basis. Some questions must be examined to understand important aspects of a mine plan. For example, where are we excavating? Where are we dumping? How is the material routed from the excavation source to the dumping destination in every period? What is the value of the plan? Answers to these questions help us understand the mine plan and its value. Every time a mine planner creates a new iteration of the mine plan, additional information and details are included. Considering the value of a mine plan can be worth hundreds of millions of dollars and in some cases billions of dollars, it's easy to argue that mine planners unlock fortunes every time the mine plan is improved. This value improvement can be quantified and compared against the previous plans. The key to success: is it the team or the software? Some contend that it is not the software that adds value to a mine plan, but instead it is the mine planning team that adds value to the project. In my opinion, the two are not mutually exclusive. 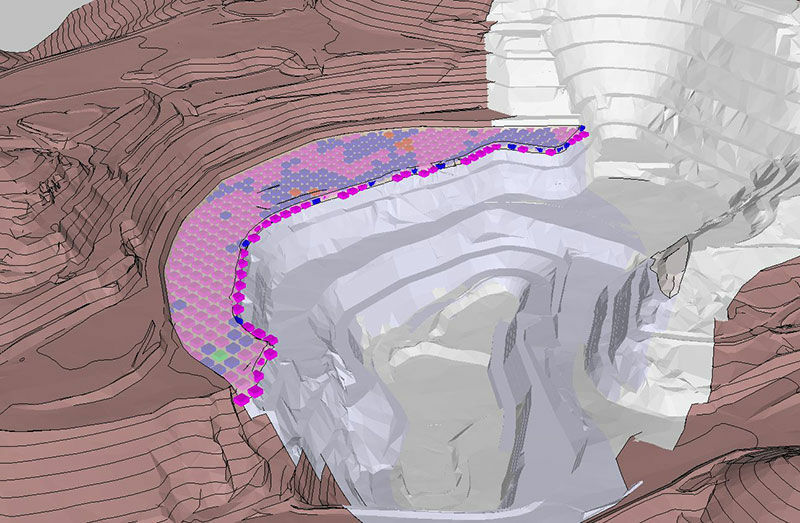 If the mine planning team does not have the tools to solve complex mine scheduling optimization problems, then it could be difficult to uncover opportunities for improvement. In the past, long-range planners had tools that produced optimum plans that were not practical, while short-range planners had tools that produced practical plans that were not optimized. Consequently, long-range planning strategies could not be followed by short-range planners or implemented by operations. Thus, computer software became more powerful and we developed programs that integrated long, medium and short-range planning schedules. There are many opportunities to improve the value of a project by improving the schedule. However, sometimes it is worth looking at the phase designs for opportunities. For example, pushback widths are typically between 70 meters and 150 meters. If a pushback is wider than necessary, it could be subdivided into more pushbacks. Figure 1 shows a pushback exceeding 300 meters in width for some benches. If we evaluate this pushback and run incremental pit shells, we could see that there are smaller areas that could be mined at a profit. Once we identify those areas, we can subdivide the original phase into pushbacks 1A and 1B. We can compare the improvements in the schedule and evaluate the opportunities associated with this change in the phase design. Figure 2 shows pushback 1 modified into pushbacks 1A and 1B. This change in the design will give the plan the flexibility to access higher grade ore earlier in the schedule, which results in a higher net present value (NPV). 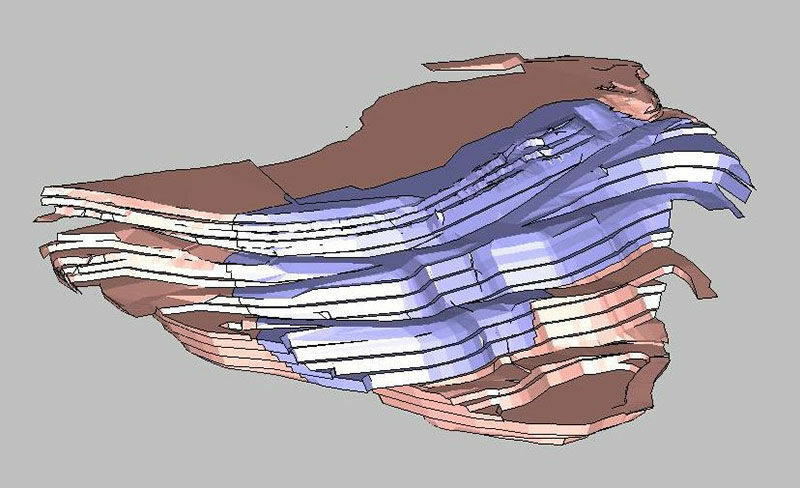 Mine scheduling involves routing material. Every time rock is moved from source to destination, there is a benefit and a cost associated with it. Let's suppose that we need to mine completely one bench in a given period, as shown in Figure 3. After the material is mined, you might ask, how is the material routed? How much of that material is ore? How much of that material is waste? 2. Modified pushbacks 1A and 1B. 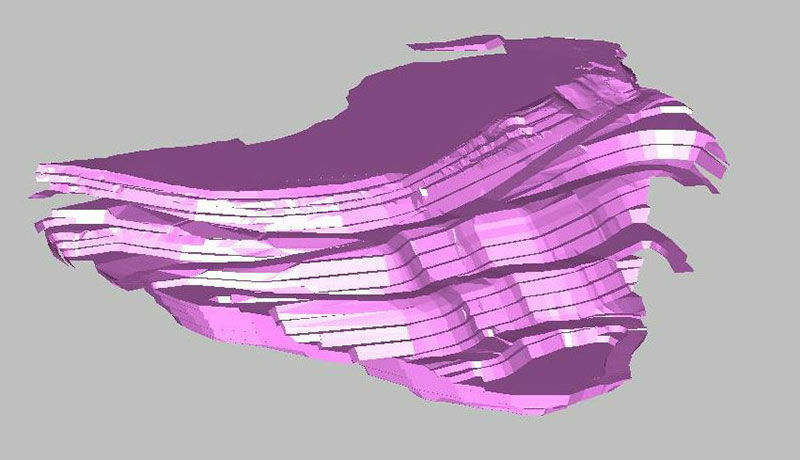 Short-range scheduling tools allow users to report the mining cuts reserves (solids or polygons), map and route material to destinations and produce material routing reports. However, there are no economics included in the input of these short-range scheduling tools and there is no real optimization as the schedule is guided by manual input. 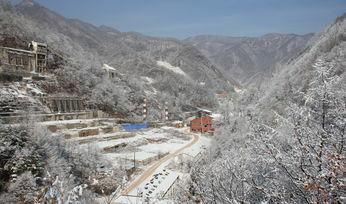 In this case, mine planners can use tools like Hexagon's MinePlan Schedule Optimizer to optimize the schedule and evaluate alternatives, which improve the production forecast and its corresponding value. Haulage costs can be significant in any truck and shovel operation and haulage optimization studies can yield millions of dollars in project value. For example, in a typical case, a mine planner will have the common sense to "haul short" to minimize haulage costs. However, if you use all your short dumps in the schedule, once that nearby waste dump location is full, it will require to "dump long" in later periods. So, you can go from needing 55 trucks in one period to needing 69 trucks in another one. Figure 4 shows two road profiles leading to Waste 1 (long dump) and Waste 2 (short dump). 3. The full bench cut. So, instead of using all the short dumps in the first period, the software can optimize the best dumping strategy to minimize the number of trucks required. The haulage optimization results in a combination of short and long dumps in every period. At the end, instead of reporting 55 trucks in one period and 69 trucks in another period, the optimization indicates the actual minimum number of trucks required, which in this example turned out to be 64. This reduction in the number of trucks is significant since each truck is worth about $5 million. Mine planning systems have come a long way in the past decade, but there are still many mines around the world manually preparing sub-optimal mine plans. This presents opportunities for project evaluation and value creation. Consequently, mine planning teams have turned to tools like MinePlan Schedule Optimizer to uncover and capture project value. 4. Long versus short hauls.